BB Engineering (BBE) has unveiled the new VarioFil R+ bottle-to-POY line during its Open House on January 21, 2015, in Remsheid, Germany. VarioFil R+ is said to be the world’s first polyester yarn (POY) spinning line which uses recycled bottle flakes as feedstock for dope-dyed textile POY. 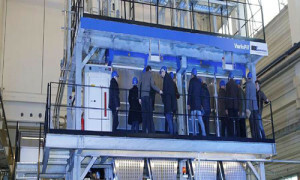 The line, developed by the subsidiary company of Oerlikon Barmag, provides a special extrusion system for bottle flake materials, latest metering and blending technology for dope-dyeing and an advanced two-step melt filtration. The turnkey machine comprises four spinning positions, each equipped with an Oerlikon Barmag 10-end WINGS POY winder. Polyethylene terephthalate (PET) has become the primary material for beverage packaging. This huge quantity of PET bottles, usually disposed as waste after initial use, is a perfect source of raw material for the sustainable production of synthetic fibers, BBE explained. The VarioFil R+ concept uses PET bottle flakes as a raw material, which avoids the additional pelletizing of bottle flakes into recycled PET (rPET) chips, leading to significant investment and energy saving. Its latest technology for dope-dyeing is also one of the most efficient processes in the world, emphasized BBE. 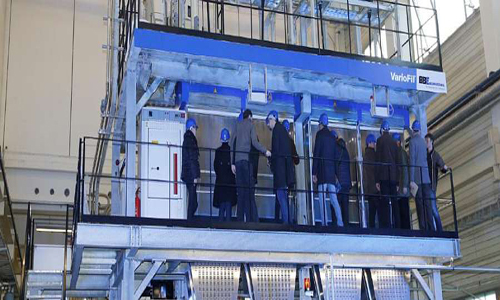 The live presentation at the Open House included the texturizing process, converting the manufactured rPOY into DTY on Oerlikon Barmag’s eAFK texturizing machine, as well as BBE’s brand-new cleaning system for melt filters, known as White Filter Cleaning WFC. It allows the cleaning of melt filters, but also of other melt-contaminated parts without any chemical solvents. BBE is a Joint Venture between one of the world’s largest manufacturer of manmade fiber equipment, Oerlikon Manmade Fibers/Oerlikon Barmag, and the Brückner Group.